As I crossed the ocean, work by Iyamoni’s masters can not end with a concert. 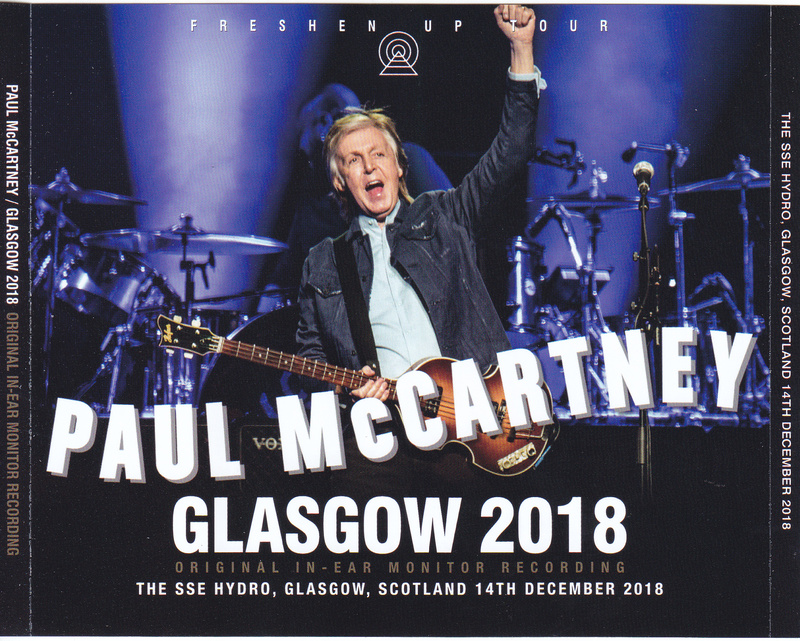 Following the last show in Liverpool, I also performed recordings at the next Glasgow performance. 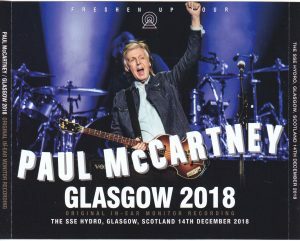 On the British tour at the end of last year, the Japanese are participating in a warming fight, and on this day etc., in the annual scene asking where we came to see the live from the audience, “We come from all the way to Glasgow from Japan I can hardly believe that, “Paul himself had exposed surprises and joy. Yes, coming all the way from Japan, the sound source of surprises released this time will be released again in limited press CD. When it comes to this, it seems that it is commonplace to listen to the latest live sound source by audience recording, or to be released. It was a wonderful era when it was easy to listen to the latest live with a clearer sound source than that. As has been proved by sound sources that have been released so far, the finish and accuracy of Iamoni recordings by masters has been steadily evolving. If unique finish is really wonderful again this time if it is expressed in one word, it is “analog like”. If the two countries’ Kokugikan which is the monument to the recording of Iyamoni in the fresh-up tour were showing the finish that they wanted to call it as if it were the live album itself, this is a live album-like atmosphere with a bit more vintage taste . Although it may be misunderstood as to whether it writes clearly as it writes, it does not matter how unpleasant it is. The clearness of the performance, which is the greatest advantage of Iyamoni recording, is still intact, yet there is no excessive high region or overhang of parts of the instrument, and it is indeed the fact that all the parts fit in the moist and tranquil sound quality Good. For example, that example applies to playing like an acoustic “Love Me Do”. The performance of each member gathers fairly well, and that is the Beatles’ likeness. Even until the sound of Tambourine before Brian’s hand is shaken when the “Hey Jude” of the last part begins, it is fresh, but interestingly Rusty plays the chord of the guitar at the place where the first chorus enters Although it was a little mistake, a careless mistake was surprising when listening and it was caught. Even if the same song is over, even the unusual trouble that the reverberation of the strings does not stop ringing from the synthesizer of Wix. Perhaps listening to it with headphones may cause him to feel illusory, but this is due to the reverberation of the synth continued (laugh). Paul, on the other hand, is doing very well this day. The tour has been continuing since September, and the stability has steadily increased steadily. 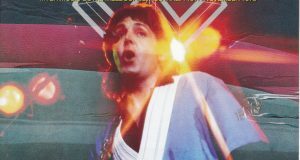 Only the “We Can Work It Out” is a place where it seems to be hard to sing, but only to the song where the number of performances has declined in the first place, Paul now sings to a song of a hard key soon to sing I guess. 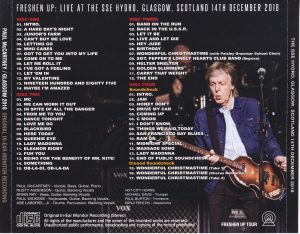 Other than that, I can see how Paul is doing right through the whole, MC is more talkative than Liverpool. Of course at Encore, December Special ‘Wonderful Christmastime’ also appeared on this day. Because it is caught in such superb sound quality, it sounds steady in stereo till a slight misalignment of children’s chorus (haha). 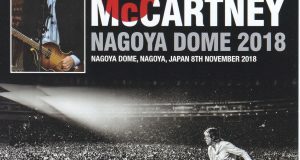 Although it is a joke, I can not help thinking that it is a repertory that I wanted to ask live at Tokyo Dome by listening to this. 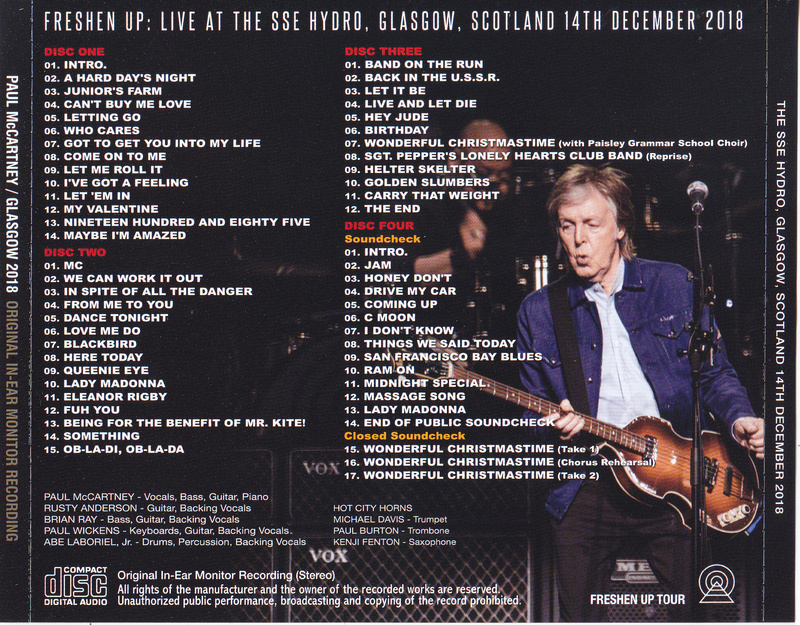 And on the fourth disc, there is a public sound check for VIP ticket · audience. Opening instruments and jams will be played with rockabilly-like up-tempo performance. Among those jams, the first is flat monaural, then thicker monaural, then the thicker monaural, and finally to stereo, but just listening to that change will you see the evolution of the current Iyamoni recording As. 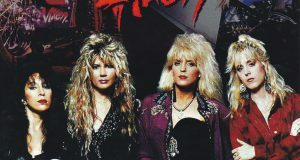 The sound quality from becoming stereo is the ultimate sound quality that is thick and losing to the main part of the live, and the answer is sufficient. The power of ‘Coming Up’ with a horn is always a masterpiece. This is a sound repertoire repertoire. The next “C Moon” is a wings number which is not supposed to be played in the final stage at the end, but the clear and rich stereo sounds heard here are magnificent enough to be enchanted. Although it is sufficiently gorgeous contents just to be listened to with the highest stereo sound up to the part of the public sound check, even after that, even a serious rehearsal of the special repertory for encore “Wonderful Christmastime” is documented. Liverpool is a LIPA student who is supposed to be a part of Paul. Although the chorus team was able to procure the chorus team, this time, a serious rehearsal for night is being held after raising the chorus unit from the school in Glasgow. Firstly, I will take a take after the meeting for a while (the part is low volume). At first it is interesting that the chorus of rusty and wicks are conspicuous, and gradually the volume of children gradually increases so that the appearance that you are trying to match while watching the performance of the band is transmitted. In addition, the serious rehearsal of this place is recorded with stunning stereo sound. Although there are children, their interaction between the songs is irritating, but it makes me feel realistic realism as if I am on the stage rehearsals. Next, it is also rehearsal that children repeat the part that the children sing. Finally, I will take another take, but the result of the practice clearly appears as the chorus gathers more than the first take. The latest release of “Wonderful Christmastime”, the latest live version that led to fans all over the world at the end of last year, is not only production, but also rehearsal patterns are heard with amazing sound quality. Further shock to the maniac who thought that it was only Liverpool! ★ Liverpool is an official live class super high quality stereo IEM as well. This is also amazing. 11. Eleanor Rigby 12. Fuh You 13. Being for the Benefit of Mr. Kite!